*Not a Member? Learn how to become a member at the NHRA Midway Display! Stadium-like Route 66 Raceway, which opened in 1998 just outside of the Windy City, has regularly been the site of astounding performances. The event hosts the JEGS Allstars, which pits the best NHRA Lucas Oil Drag Racing Series racers from across the country in individual and team competition. Tickets can be purchased online by clicking the TICKETS button above or by calling 888-629-RACE (7223). Purchase early and save! How to Get There: The track is approximately 30 miles southwest of Chicago on Route 53 (historic Route 66), three miles south of Interstate 80 in Joliet. From points north, take I-355 south to I-80 west to Route 53/Chicago Street (Exit 132) and proceed south to the track. From points south, take I-55 north to Arsenal Road, then proceed east to Route 53 north to the track. From points east and west, take I-80 to Exit 132 (Route 53) and follow Route 53 south to the track. 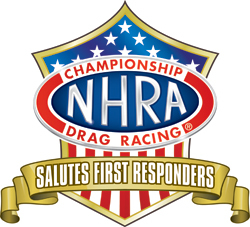 As part of the tribute, first responders will be eligible for discounted tickets to the JEGS Route 66 NHRA Nationals through SheerID. Click here to purchase.